After the brain is removed from a mouse, it can remain alive for up to 10 hours. In a neurobiology and behavior lab in Hall-Atwater, it’s an eventful 10 hours. Robin Cotter ’13 MA ’14 transfers dime-sized slices of the brain from the skull cavity and place them in a petri dish filled with artificial cerebrospinal solution (ACSF). ACSF mimics the fluid surrounding the brain inside the head; comprised primarily of salt, the fluid bubbles with oxygen pumped into the dish from a tube. Cotter takes a dish with a single coronal slice and bring it next door to an electrophysiology rig that takes up half the room. She places the brain sliver into a recording chamber and attach an electrode to each hemisphere. 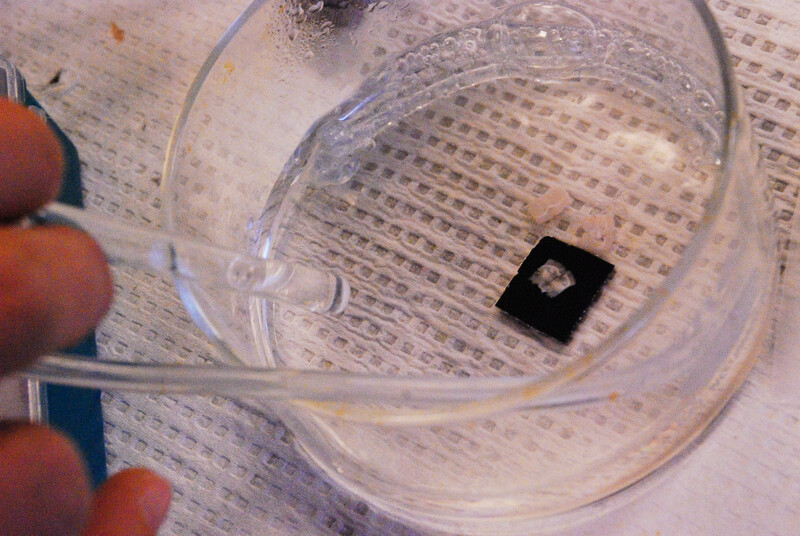 Then, she flips a switch on a connecting rig, adding a molecule called bicucculline to the spinal fluid. Within 20 minutes, the solution causes the cells in a small area of the brain slice to fire uncontrollably. The firing spreads quickly, jumping from one hemisphere to the other, eventually engulfing the entire brain. Cotter is recording an epileptic seizure. Epilepsy, its causes, its conditions, and its solutions are the ultimate focus of three interconnected labs in the Univesity’s biology department. For eight years, professors and a revolving group of undergraduate, graduate, and PhD students have collaborated and published research on the hypothesis that cells can be transplanted and incorporated into the epileptic brains of animals in order to halt seizures entirely. Human brains, like those of all adult mammals, don’t regenerate after damage. However, some animals, such as goldfish, can regrow a severed connection between, say, its eyes and its brain. Not so for people. Cells called neurons play the role of messenger in the central nervous system, processing and transmitting information between one another by sending signals in the form of action potentials—an electrical impulse that travels down the length of a neuron. They are constantly firing signals. As an undergraduate at Mount Holyoke College in Massachusetts, Janice Naegele, now Professor of Biology and Neuroscience and Behavior at Wesleyan, began to question why, when humans suffer a traumatic brain injury, they lose those neurons forever. As an undergraduate, graduate, and post-doctoral student, Naegele studied how and why cells die. What she couldn’t find was the relevance of these questions to human health. Epilepsy, she discovered, was immediately relevant. Epilepsy is a neurodegenerative disease caused by a genetic mutation, a stroke, cancer, or a traumatic injury affecting the brain. Epilepsy causes excessive, uncontrollable activity in brain cells, resulting in seizures. In some types of epilepsy, important neurons are killed off as well. Epilepsy is more common than breast cancer, affecting one percent of all people worldwide (approximately 65 million). It also cannot be cured—at least not yet. A few years after arriving at Wesleyan in 1991, Naegele found herself in a car with Professor of Biology and Science and Society Laura Grabel. Grabel’s research at the time centered on making new neurons from embryonic stem cells. The particular form of epilepsy that their labs examine is temporal lobe epilepsy. Part of the cerebral cortex, temporal lobes sit just above the ears, around the temples, and deal with language comprehension and the formation of new memories. In temporal lobe epilepsy, the hippocampus gets hit hard. After babies develop and are born, only two regions in the brain continue to make new neurons throughout life: the olfactory bulb of the forebrain, and the dentate gyrus area of the hippocampus. Specifically, the hippocampus produces granule cells, which act as the gatekeepers of the brain. When a seizure comes through the temporal lobe, granule cells are there to stop it. Attached to the granule cells, as well as to other excitable neurons that push forward action potentials, are cells called interneurons. They normally act as inhibitors: these interneurons release a transmitter called gamma-Aminobutyric acid (GABA), which binds to receptors in their connected neurons and tells the neurons to stop firing action potential, thereby regulating activity. Interneurons keep the nervous system in line. But temporal lobe epilepsy suppresses adult neurogenesis and destroys inhibitory interneurons, which cannot be replenished. With neither granule cells nor interneurons in place, nothing prevents cell activity from spiraling out of control. That unregulated activity is a seizure. To record the disorder in mice, the lab artificially induces epilepsy. When Cotter works with brain slices, the bicuculline blocks those GABA receptors from regulating action potentials. For a live mouse, an injection of the compound pilocarpine will cause the animal to develop chronic epilepsy, allowing researchers to study the disease over a long period of time. The effects are the same as for humans: spontaneous seizures, cell death and overall brain degeneration. If the interneurons won’t replace themselves, perhaps they can be created by hand. That’s the primary concern of Grabel’s stem cell lab. And so far, the results show that they can. Stem cells can grow to become virtually any cell in the body. Grabel and Naegele realized that they could possibly alleviate epilepsy with a stem cell therapy that replaces the neurons lost in seizures. If the cells already in the brain are not doing their jobs, then stem cells could theoretically come in and do it for them. Grabel begins with embryonic stem cells from mice. Cells taken from an embryo before implantation can be transformed into embryonic stem cells, which then can be differentiated into whichever type of cell the animal—or scientist—requires. They just need a push in the right direction. In ordinary development, interneurons arise from the ventral part of the brain. A signaling protein in the ventral area called “sonic hedgehog”—yes, named after the videogame character—tells neural stem cells to turn into inhibitory interneurons. All in a petri dish, Grabel’s lab denies signals to the embryonic stem cells, forcing them onto the neural stem cell pathway, and then floods them with the sonic hedgehog signal to transform them into inhibitory interneurons. She and her students are able to reproduce those results consistently. Because mouse embryonic stem cells require such manipulation, Naegele’s lab conducts most of its experiments using cells from the early mouse brain, which have already taken steps toward becoming interneurons and thus are easier to work with. But now that Grabel’s experiments have shown success, the scientists expanded their research to human embryonic stem cells. In order to do that, Grabel said they have to circumvent some political obstacles. Although no laws in the U.S. prevent scientists from sacrificing a human embryo, restrictions do exist that prevent federal funds from being used to make a new human embryonic stem cell line. A number of corporations, private foundations, and state governments, however, make resources available to scientists interested in this research. Both Naegele’s and Grabel’s labs regularly win grants from Connecticut’s Stem Cell Research Program for this very purpose, in addition to receiving funding for more clinically-aimed projects from CURE Epilepsy and the National Institute of Health. Creating the interneurons solves only one problem, however. Once the cells are ready to replace those lost in epilepsy, they must be transplanted into the brain. And, once transplanted, the interneurons must survive. As a kid, Associate Professor of Biology and Neuroscience & Behavior Gloster Aaron crashed his bike. Soon after, Aaron began experiencing what he felt as small attacks, miniature seizures. He would feel an “aura” first: a moment of terror, a rising feeling of nausea, maybe a heat flash. A sense of déjà vu would overwhelm him, or sometimes its opposite sensation, jamais vu, a moment of lacking recognition. As his seizures worsened, Aaron would lose consciousness, staring blankly ahead, unresponsive. In the worst-case scenario—a grand mal seizure, where the seizure spreads throughout the entire brain—he might collapse, unconscious, his limbs jerking uncontrollably. Aaron said nobody is able to recall what it’s like to have a grand mal seizure. He can only remember waking up. Only later did Aaron identify his symptoms as part of temporal lobe epilepsy, caused by the bike crash. His symptoms were common of epilepsy patients and are indicative of the type of damage the disease does. Feelings such as déjà vu and jamais vu occur because seizures attack the hippocampus, which is located within the temporal lobes and associated with functions of memory. After epilepsy kills off the gatekeeper cells—the granule cells and the interneurons—an attack can spread to the rest of the brain and affect the nerves that control body movement and other functions. Like many other people with epileptic symptoms, Aaron takes anti-seizure medication. The first drug he tried had no effect whatsoever, but the second one he tried rid him of the seizures permanently. His success is unusual: about 30 percent of patients who develop temporal lobe epilepsy from traumatic brain injuries never find relief from seizures, according to Naegele. Anticonvulsant drugs sometimes stop the seizures, but for some people, the drugs eventually stop working. The compounds target neurons to reduce their excitability, but neurons respond by increasing the effectiveness of their receptors. Higher levels of the drugs are required to achieve the same effect, to the point where the drugs actually become toxic to the patient. Side effects can be almost as debilitating as the disease itself. Severe epilepsy restricts some patients from driving cars, riding bicycles, or even standing in the shower by themselves. Because of the limitations, Aaron said, there’s a stigma surrounding people with epilepsy. Some people are afraid to be diagnosed because of the legal and social repercussions. For people who suffer from severe seizures, however, the options are limited. Previously, surgery was the only alternative if drugs failed. Removing one temporal lobe might eliminate the source, but if the seizures continue, removing the other lobe is impossible: the one and only time such a procedure was performed, on a Hartford patient known as “HM” (who also suffered a bike crash), the patient survived the surgery but could never create any new memories. The researchers at Wesleyan believe stem cell therapy can do what other treatments cannot: cure epilepsy, safely and completely. But they won’t know for sure for years, or maybe decades. Aaron joined Naegele and Grabel in their project soon after he joined the faculty in 2006. He provided the critical diagnostic part of their experiments. Naegele and Grabel’s labs could inject mice with healthy interneurons, but they couldn’t see what was happening at the cellular level: if the cells incorporated into the area they were supposed to, bonded with the other neurons, and returned the brain to its normal functions. His electrophysiology equipment could record just that. Each electrode has a very sharp, hollow tip at its end and is filled with a solution similar to the inside of the interneuron. By poking a hole in the membrane of the cell and sealing the electrode to it, researchers can allow the flow of neural signals from the cell to the electrode. By comparing the activity of brains with transplanted cells to brains without, researchers can determine whether the transplanted cells are maturing into, and functioning as well as, the cells they are meant to replace: brains with transplanted interneurons, if all goes as it should, should have more inhibitory activity from those cells than in brains where interneurons have died off. Aaron explained that his research clears up uncertainties in the research of Grabel and Naegele. Lizzie Paquette ’15 is one of the many students taking a closer look at these synapses. A Middletown resident, Paquette became involved with Naegele’s lab while still in high school. Now a double major in neuroscience & behavior and math, she has a particular interest in granule cells—specifically, how they are affected by epilepsy and how they will divide and connect to the transplanted interneurons. To do so, Paquette must label the granule cells so she can differentiate them and their offspring. She injects into the mouse brain a retrovirus, which carries genetic material in the form of RNA (ribonucleic acid) and transcribes it into the DNA of infected cells. With a gene encoding a red florescent protein, the retrovirus infects only cells that are dividing at that moment, allowing Paquette to identify the newborn granule cells. 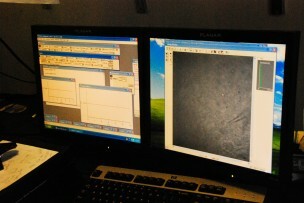 Now that Paquette can distinguish the granule cells, she can see what they are up to. In her research, Paquette has found that epilepsy actually changes the appearance of cells to an extreme degree. “They have dendrites going down in the wrong places, and their cell bodies are sometimes not in the right place, and so we think—and lots of other people think, too—that in epilepsy, this population gets really weird-looking because they’re sending axons back up and attaching to themselves and making these hyperexcitable loops,” she said. In a normally formed neuron, the axon sends signals to the dendrite of a neighboring neuron, like relay racers handing off a baton. But if a neuron attaches an axon to itself, it might keep sending and receiving the same signal over and over again. Paquette checks how close the transplants and granule cells are to each other to find out if the cells formed a synaptic connection, which would theoretically allow the inhibitory interneurons to silence those hyperexcitable loops and stop seizures. To test if that actually happens, Paquette needs a newly invented technology called optogenetics. The early mouse brain-derived cells used for these transplantations are genetically equipped with light-activated pores called channelrhodopsins. When the pore receives light, depending on the color, it either opens or closes up. 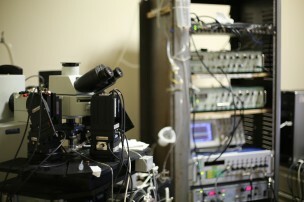 By controlling light flashes into the mouse brain, researchers can activate and open those neuron pores at will, which releases their inhibitory signals into the connected granule cells. With such a tool, researchers can now measure the isolated effects of the interneurons on seizures and behavior. Paquette’s research, like that of many other students in the labs, tackles questions of what Grabel calls “basic science.” However, it also has clinical relevance to the end goal of developing stem cell therapy—a prospect not far from the imagination. In the January 2012 issue of the Journal of Neuroscience, Naegele, Grabel, and Aaron, along with Xu Maisano Ph.D. ’11 and Elizabeth Litvina B.A./M.A. ’11, published an article titled “Differentiation and functional incorporation of embryonic stem cell derived GABAergic interneurons in the dentate gyrus of mice with temporal lobe epilepsy.” Their paper showed their success in developing mouse embryonic stem cells and transplanting them into the brain to become normal inhibitory interneurons, the first project of its kind. More recently, the labs submitted another paper in which the transplanted neurons are not derived from embryonic stem cells but rather straight from the early mouse brain. Gauging its success, however, requires more than examining the brain on a micro level; in order to truly understand the effects of stem cell therapy, the mouse as a whole becomes the test. Even if the replacement interneurons can integrate successfully into the brain, they do not necessarily cure all the symptoms of epilepsy. Beginning this year, Naegele invested lab funds into studying whether transplants make any noticeable differences, positive or negative, in mouse behavior. Working in the lab over the summer, David Reinthal ’16, a double major in economics and neuroscience & behavior, did the preliminary behavioral tests. He was working off a graduate student’s hunch that such a project might be worth exploring. Since then, Naegele has dedicated thousands of dollars of equipment, software, and other materials to this research. “One of the things we want to test is, do our transplants actually help these people in ways that are not just seizure reduction and duration?” Reinthal said. Behavioral tests check for two main areas of cognitive damage: memory and personality. Human patients with temporal lobe epilepsy report having issues with memory, anxiety, and aggressiveness, and mice with epilepsy experience similar symptoms. Reinthal uses a Zero Maze experiment to test the difference in these indicators among epileptic mice, mice with transplants, and healthy mice. The circular maze is split into four quadrants with walled enclosures on opposite ends, where the mice can hide, and open areas, where the mice can run around. Although Reinthal says it’s too soon to come to any concrete conclusions, he has found so far that mice with epilepsy and no transplants are more anxious and tend to stay in the enclosed areas more. Mice with transplants, while less anxious than mice without, are still below the activity levels of the control group. It’s not quite the panacea the researchers hoped for. Memory tests, however, indicate more optimistic results. In the Morris water maze, a resting platform lies just below the surface of a water-filled tub. Reinthal has the mice swim in the tub for a few days, enough time for them to memorize the location of the platform. Then Reinthal removes the platform and records how many times the mice swim over the area where the platform used to be, thinking they will find a place to relax. The more passes, the better the memory. In tandem with the cellular tests, the behavioral tests, which Reinthal conducts with a group of about 20 mice, draw an image of how stem cell therapy will impact the day-to-day lives of patients. For this procedure to ever become a practical reality, let alone be approved to test with human patients, the researchers must be sure of the consequences. Tests can take just a few hours or can span weeks, even months. Between all the stem cell, electrophysiology, and behavioral projects, the amount of data collected is immense, and it takes a while to quantify, and qualify, the results. This is not short-term research, and the already large scope of the labs continues to grow. New funding, new equipment, new techniques, and new people are also constantly being added to the collaboration. From a mouse embryonic stem cell to a functioning mouse interneuron. From a human embryonic stem cell to a functioning human interneuron. From there, a human solution to epilepsy, and a better understanding of how the human brain works. At least, that’s the hope of Naegele, Grabel, Aaron, and their teams of researchers. “It’s science fiction I would never have thought I would be doing 10 years ago,” Naegele said.